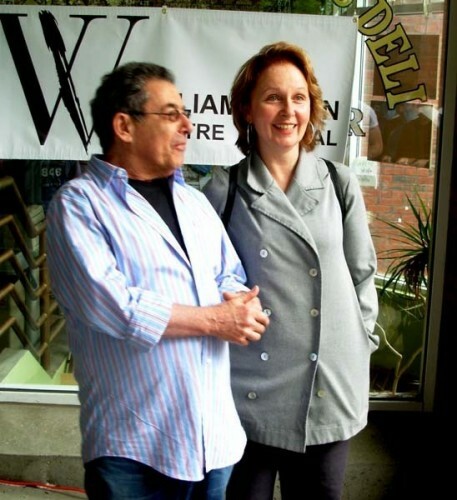 Kate Burton with Nicholas Martin during his first season as artistic director of WTF. Giuliano photos. Martin will director her in The Seagull at the Huntington next season with her son Morgan Ritchie. Kate first performed at Williamstown in 1980. Burton in Beyond Therapy. WTF photos. With Morgan in The Corn is Green. Kate Burton stars in Tom Stoppards’s Hapgood a just about sold out, two week run (July 10 to 21) in a return to familiar home turf at the Williamstown Theatre Festival. Her husband Michael Ritchie formerly was its artistic director for nine years with the current AD, Jenny Gersten, as his assistant producer. The Tony nominated star of stage, screen and TV discussed a remarkable family legacy of theatre, as the daughter of Richard Burton, and mother of Morgan Ritchie. They appeared together at WTF in The Corn is Green in 2007. 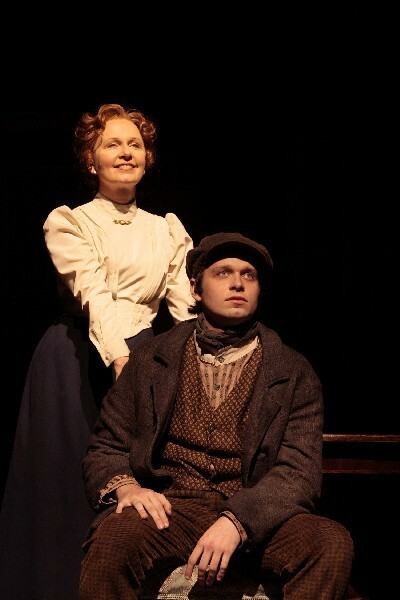 This season at Boston’s The Huntington Theatre, directed by former Huntington and WTF artistic director, Nicholas Martin, they will perform together in Chekhov’s The Seagull. As an undergraduate at Brown University Burton majored in Russian Studies preparing for a career in diplomacy. A professor mentored her in not avoiding the obvious. That led to graduate study in theatre at Yale University. But that background in Russian left her with a passion for Chekhov and Stoppard as she explained. In the past few seasons she has performed on TV as strong women in politics. Those roles are so realistic and compelling that I asked if she has considered running for office? Charles Giuliano You open on July 11 in Hapgood which is pretty well sold out. 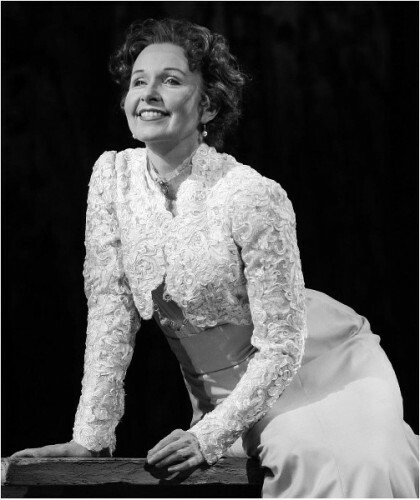 Kate Burton It is although there are still some seats. CG I think that’s the strongest advance sale of any Berkshire theatre this season. CG Can you give us some indication of why that is? KB I have no idea. Perhaps the theatre can tell you that. I don’t think I can. It’s an incredible play that doesn’t get done very often. It’s not an easy play to do. It’s not a huge cast. It’s a very challenging and wonderful play. If you love Tom Stoppard you will love this play. CG We see you often on TV mostly in roles as a very strong woman. Most recently in Scandal as a right wing Vice President. You appeared for the first three seasons (and eighth) as Dr. Ellis Grey in Grey’s Anatomy. You are so natural in political roles. When are you going to run for office? KB (Laughs) I don’t think I can. I don’t think I’ll pass all the tests. That’so cute to ask. As an actress you go through periods of playing certain kinds of roles. I seem to be in my political, governmental phase right now. When I was in Grey’s Anatomy I was in my very challenged, mental illness phase. I did a lot of parts like that around Grey’s Anatomy. I did Empire Falls (2005 PBS mini series based on the Richard Russo novel with Ed Harris, Paul Newman, Helen Hunt and Philip Seymour Hoffman). I did a movie called Stay (2005) with Ewan McGregor. I played a woman who was an apparition actually. I have to say though I’m enjoying the political ladies a bit more. It’s just weird the way these things happen. I’ve been doing my part as Vice President on Scandal. Also I played Senator Barbara Hallowes on Veep with the brilliant Julia Louis-Dreyfus. I’ve always had my eye on Hapgood. Ever since I saw Stockard Channing play it so brilliantly at Lincoln Center. I’ve always loved this play. That was my first real falling in love moment with Tom Stoppard’s work. I did Arcadia which I think is one of his masterpieces. Right before I did that I saw Hapgood. And I thought, oh yeah, I definitely want to have a go with Hapgood some day. We are. I just can’t believe that it’s come to pass. Kenny and I have been talking about it for two years. We were trying to find the right director for it. Which we did in Evan Yionoulis this wonderful, incredibly smart, fabulous director. There’s a lot of shenanigans in the show in terms of spy vs. spy. There’s a huge spy ballet as we call it at the beginning of the show. With a brief case that’s moving around and a swimming pool. The set itself (Chris Barreca & Chris Heilman) is a real tour de force for the director, Yionoulis, and Tom Stoppard. It’s always incredibly exciting to work on Stoppard and his profound relationships. You might be talking about physics, or counter intelligence. At the end of the day it’s about two people and how they’re navigating each other. In this play I have three very profound relationships with three different men. Which are not necessarily love relationships. It’s all about people, which makes it so exciting to work on, and it’s always exciting to work on a brilliant playwright’s work that doesn’t get done that often. Williamstown is the perfect place to do it. You have a very smart and committed audience. For me it’s where I feel most at home. As an actor. CG The Arcadia which you mention. Was that the Huntington production? KB No I was in Arcadia at the Center Theatre Group in Los Angeles before my husband, Michael Ritchie, ran it. About sixteen years ago I did Arcadia having read it and seen it in London. I went to the National Theatre with no plan to see any particular play. Arcadia was playing. I bought a ticket and went upstairs. The minute the play started I went Oh My God. (stretching of God with comic emphasis). I had always liked Stoppard’s work. Who didn’t. That was the play when I fell in love with his work. CG There’s a Stoppard translation of a French play Heroes at Shakespeare & Company this summer. CG It’s a translation but very Stoppardesque shall we say. KB He’s something you know. He’s just an amazing, amazing writer and an amazing person. I was so struck when I saw Rock ‘n’ Roll (2007) on Broadway. I’m always so struck by his story. I was so privileged to narrate a story on Stoppard recently for NPR. I got to hear his story again about a little boy coming from Czechoslovakia. Of course he has such an understanding of the Slavic mind. The character that Jake Weber plays and I play a Russian scientist. It’s a profound understanding of those characters. Rufus Sewell, what an actor. He was just brilliant in Stoppard’s Rock ‘n’ Roll. It’s always interesting to see a great playwright’s work and how he introduces himself. There’s a part of Tom in each play. There’s a character of Tom in each play which is antic and hilarious. That brilliant brain of his. CG I first saw you in The Cherry Orchard at the Huntington. KB I’m so happy you saw that. CG You’ve had a close relationship with Nicholas Martin and you came to WTF during his first season. Is that when you did The Corn is Green? KB No that’s when I did Beyond Therapy by Christopher Durang (2008). I was not directed by him. I did The Corn is Green, directed by Martin, when Roger Reese was the artistic director of WTF. It was Roger Reese’s last season (2007). CG I’m often told that theatre is a family. You appear to have an intimate relationship with Nicholas Martin and an historic one with Williamstown Theatre Festival. Would you discuss those relationships? KB Oh yes. I’ve been coming to Williamstown since 1980. When I was a student at the Yale School of Drama. Then my husband (Michael Ritchie) and I came up in 1987. That was his first introduction to Williamstown. By the next year we had our little boy Morgan Ritchie. When Morgan was about seven my husband took over the theatre. 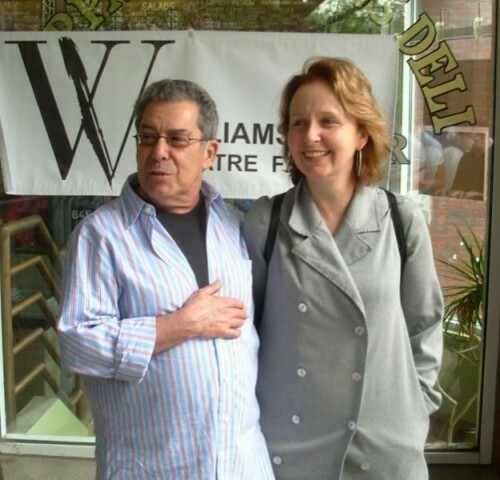 He ran the theatre for nine years with Jenny Gersten as his associate when he was artistic director. At the same time, as Morgan was growing, he would always appear in the productions. Then we had our daughter, Charlotte Ritchie, in 1998. She started to appear in all the plays. Although she doesn’t want to be an actor. She’s now 15. Morgan went through the classics. When he was 15 he was an apprentice. He was a non Equity actor for two years. His first year as an Equity actor he was in The Corn is Green with me. That set him on his way. In tandem, my mother, Sybil Christopher (27 March 1929 – 7 March 2013), was running the Bay Street Theater in Sag Harbor (founded in 1991). That’s another place where I worked quite consistently. There were co productions happening through the years. I did three co productions including Hedda Gabler. Of course my father is Richard Burton who was a great, great actor. KB We’re all interconnected. Nicholas Martin, Jenny Gersten, and Roger Reese are like virtually members of our extended family. I’ve worked with Nicky, by now, what eight shows. We’re going to do another show, The Seagull, at the Huntington with me as Irina Arkadina and Morgan Ritchie as her son Konstantin Tréplev. It doesn’t end. It doesn’t end here. It continues. CG What was your father’s influence and impact on you going into what is now the third generation of the family business? KB My dad, when I was growing up, I was really committed to exploring lots of different avenues in life. It wasn’t until I was a senior in college that I decided to pursue acting. I always acted. I loved to act. I enjoyed doing extra curricular theatre both in high school and college. But I was a history and Russian studies major. I was preparing to pursue a career in diplomacy. I grew up in New York City and went to the United Nations School. I was surrounded by diplomats’ children. That was something I really thought I would do. I went to Brown University and my senior year my wonderful advisor, Professor Abbott Gleason, my Russian history professor, said to me “You have a gift that you’re pushing away because of your family.” It wasn’t that I had a great relationship with my dad. I was really brought up by my mom. My mother always loved the theatre but she was not running a theatre at this time. She was actually being a literary agent in LA. When kids of actors choose to become actors it’s a very interesting thing because you see the acting profession in many different ways. There was my father and my step mother, Elizabeth Taylor, as well as my step father, Jordan Christopher, who was a working actor. I had these three actors intimately in my life. I saw huge movie stars. I also saw the life of a working actor. I also had tons of actors in and out of my house at all times. So I saw all different kinds of actresses but frankly none of the actresses I encountered I thought I was like. They were all kind of larger than life; their personalities. I knew that was not who I was. So, I thought, this seems strange. When I talked with my professor at Brown I thought, well, I would like to give this a try. That’s when I applied to drama school. I had no interest in starting to be an actor at that time. A lot of actors want to do it right away. I did not. I wanted to get the training. Because I also knew I was dad’s daughter. Dad was so stratospherically famous when I was a kid I thought I can’t go into this. I was a good student. I wasn’t like an A plus student. I was a really good B plus student. But I knew I had to do it right. For me. So I went to Yale. I got into Yale and that was great. That’s where I really became an actor. At Yale. I did three years at Yale and two summers at Williamstown. In 1980 and 1981 when Nikos Psacharopoulos ran the festival. That was the beginning and it was an incredible beginning. Because I was able to have my own journey. It was not I am Richard Burton’s daughter. I was Richard Burton’s daughter and I still am Richard Burton’s daughter. I will always be his daughter. I’m very proud of that. I also have to be Kate Burton who went to Yale. Who went to Williamstown. Who went to Brown and got a degree. Nobody in my family had finished college. It was a big deal that I finished my education. It was very important to me. I’m very methodical. It was very important to me to do it in that way. There’s that great Flaubert quote “Be bourgeois in your life so you can be wild and crazy in your work.” ("Be regular and orderly in your life like a bourgeois, so that you may be violent and original in your work.") I’ve always used that as my MO. I really live a very wonderful great life. With my fabulous husband, Michael, and our two great kids. I’m very much a homemaker. No, I’m not a homemaker but I’m very settled. In my work I get to play all these crazy ladies. CG Being the daughter of a famous actor gives name recognition. It would seem to open doors. CG Did he see you work? Did he critique you? Did you have a dialogue about theatre? KB We had a dialogue about acting. We never worked in the theatre together. He did see me in three shows: Present Laughter, Winners by Brian Friel, and Doonesbury a Broadway musical. He saw me in all three of those shows. We worked together in Alice in Wonderland for PBS. We had one scene. We did a mini series together in England (Ellis Island, 1984) right before he passed away (10 November 1925 – 5 August 1984). That was wonderful. I didn’t need help with theatre. I really didn’t. I had a good strong feeling about theatre. I had great training and had worked with extraordinary actors. From day one. My first professional production, my first two leading men were Frank Langella and Christopher Reeve. My first leading lady was Colleen Dewhurst. That was my first summer at Williamstown. It was amazing. Then I went back to Yale and did Twelfth Night. That was my first major role there. What dad really helped me with was putting me in front of the camera. He helped me with that. When we were doing the mini series in England he helped me to modulate. That’s the hardest thing to go from a theatre education to learn to work in film. It’s a big jump. I only have a couple of minutes before I start rehearsal. Is there anything else you need to ask? CG I did want to mention that I danced at your mother’s discotheque in the 1960s. KB You did. Ohhhhhhh (sighs). At Arthur. That’s nice. That’s the other thing. The most important thing. The most important person in terms of my growing up was my mother. She just passed away about three months ago. Without her? Forget it. I’m the person, woman, actress, mother, everything I am today, because of her. She was the one. CG Audiences tend to assume that the person they see on stage or on the screen are a reflection of who that person is in real life. I have come to know and admire you as a very strong woman. Is that fair? KB (laughs) My children might disagree. I always play these parts. What can I say? I’m very comfortable playing these parts. Sometimes I play women who are vulnerable. Believe me, Hapgood has a lot of vulnerability. In the past fifteen years I’ve taken on these larger than life women. It’s not like a conscious choice on my part. I want to humanize them. It really started with Hedda Gabler I think. Taking that iconic role and finding my way into her. That’s what I love to do. I love to take these complicated women and find the human element. Rather than just making them automatons. I feel this is happening in all mediums. In all the work that I do. Particularly in television and theatre. CG Because of your background in Russian studies do you have a particular passion for Chekhov? KB Yes. I have a huge passion for Chekhov. I have done all of his plays. When I do the Seagull (next season at the Huntington Theatre in Boston) I will have done them all multiple times. It’s why I love Stoppard. For me it’s the most perfect synthesis of a British sensibility and a Slavic sensibility. Because he’s both. In the past 20 years I have really found my way into him. Of course Hapgood is the perfect character because she’s a British spy. She fell in love with a Russian. She speaks Russian. I even get to speak a little Russian. I know he didn’t create it for me but it feels like he created it for me. It’s a part that I always knew I wanted to play. "Charles, you have topped yourself with this one. Getting at the heart of a Burton. Congrats!" "A fascinating and interesting read. Mr. Guiliano get's his subjects to reveal facets of their personalities and history not normally covered in a press release, or a 10 second sound bite. His "beat reporter" background really shines in these interviews. Potential "Hapgood" audience members... read for insight and enrichment before you go."